How effective are Clinical Decision Support Systems? From managing medication, improving documentation, enhancing communication – both among providers and between providers and patients, health IT can equip physicians to provide evidence-based preventive and chronic care. Multiple surveys done across medical setups to understand the usage of such tools have shown positive outcomes. For example one of the researches indicated that using clinical decision support predictive tools along with electronic health records can bring about a considerable decrease in the use of antibiotics for infections related to the respiratory track. This results in reducing the cost of treatment and also chances of over treatment. The facility to using alerts in workflows has been found to result in highly valuable outcomes. EHR alerts have made it possible for physicians to facilitate end-of-life discussions with patients who are terminally ill. It makes it possible for them to understand the preferences of such patients before they are admitted or in crisis mode. CDS alerts have also shown wonderful results in reducing the need of conducting repeated tests in cases of heart failure. The norm otherwise is to generally perform multiple tests in order to measure the severity of heart failure. The cost incurred in implementing an EHR system is quiet high. The system offers multiple functionalities to its users. However, what is being seriously debated is the possibility of EHRs to achieve both – reduction in care costs and in parallel improve care for patients. Research done in this area has again shown that providers can expect the best return on investment if they are using the clinical decision support provisions in EHRs. 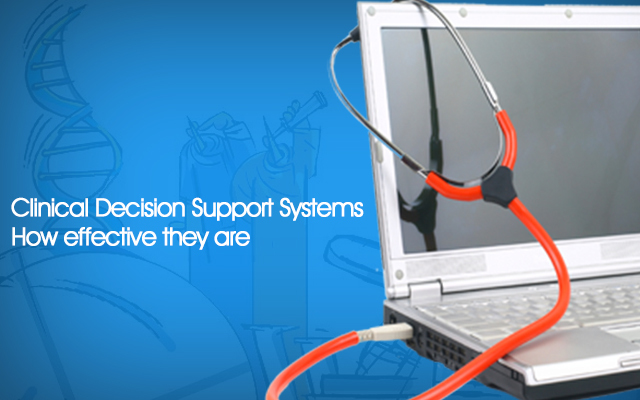 The solutions provided by Clinical Decision Support systems are used across multiple areas. Some examples include diagnosis decision support, drug databases, care plans, disease/drug reference tools, surveillance software etc. All these tools need to be aligned both with the EHR and the clinical workflow to be completely active. Given its relevance, it is not a surprise that the emerging healthcare models like ACOs (Accountable Healthcare Organizations) have high demand for Clinical decision support systems. In order to draw the maximum possible benefit out of the systems, ACOs are gearing up by developing capabilities in terms of trained workforce who know the art of optimally using them to their benefit. For physicians, using CDS brings about a whole lot difference in their daily activities. Rather than having to refer to notebooks and keep in mind information related to drugs and health conditions, using the support tools helps them save a lot of time and make better decisions during encounters. CDS systems are broadly divided into two categories- Standalone & Accessory. The standalone software runs on a computing platform and provides diagnostic or treatment recommendations. Accessory software on the other hand supports the functionality of a particular medical device. One of the challenges on adapting CDS to clinical workflows has been that of adjusting to its sensitivity. The alert fatigue surely seems to be an area of major concern. Having to deal with large number of alerts, at any given point in time, makes it very difficult to respond to the most urgent ones. This has resulted in some serious consequences leading to loss of life in many cases. Today’s healthcare environment is undergoing a lot of change. To expect physicians to cope up with the demands without using efficient CDS systems seems highly impossible. However relevant changes need to be made to reduce the obvious loopholes which exist. Infact all healthcare IT systems generally offer multiple functionalities. Barring the ones which have to be mandatorily used, the trick for a provider is always to identify and use those functionalities which have a higher likelihood of improving healthcare outcomes with least negative fallouts. We provide Medical software development services. We are glad to share that all our healthcare developers are certified. If you would like to hire healthcare software developers from us, we would be glad to assist you at Mindfire Solutions. This Post was posted in Health Care and tagged Clinical software development, Customize EHR system, Dedicated QA team India, develop hospital management system, develop medical billing software, develop medical e-learning solutions, Develop medical practice management software, Develop medical practice management system, develop patient portal, EMR EHR Software development, emr software development india, healthcare it development, healthcare it services, healthcare mobile app development, Healthcare software application testing india, healthcare software development, healthcare software integration, healthcare software maintenance, hire healthcare software developers, iphone healthcare app development, iphone medical app developers, Medical Software development, mobile healthcare application development, offshore mhealth development, outsource mhealth development, web-based practice management system development. Bookmark the permalink.